The 2018 Hurricane season still seems to be at its peak and a storm can hit at any time. While you prepare for such an event like getting your home ready don’t forget about your health, especially your eyes. 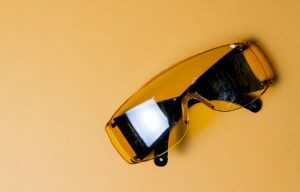 Even while boarding up your windows you should wear protective eye glasses with side shields so flying debris including dust cannot get into your eyes. Also make sure to include an extra pair of glasses, contacts or vision medication in any hurricane emergency bag. High winds will pick up debris, so make sure you put on protective eyewear. During a storm you should stay indoors, but if you have to go outside protect your eyes. High winds can turn even the smallest objects including sand or dust into projectiles that could hit and harm your eyes. If you have lived through a major storm including a Hurricane, you now once the storm is over the tedious storm damage cleanup begins. There is a lot to do and you usually do not have water or electricity for the first couple of days. That’s why it is even more important to take good care of your eyes. Wear protective glasses when cleaning up your yard and home. If you think you may have to clean up some sort of chemical spill, put on googles that way your eyes will be protected form chemical splashes. Westside Eye Clinic can help you maintain your eye health and keep your vision in focus. To make an appointment at Westside Eye Clinic to evaluate your vision, you can reach us at (504) 347-8434. For more information, you can submit a request at info@westsideeyeclinic.com. We are located at 4601 Wichers Drive in Marrero and are at your service Monday through Wednesday from 9am – 5pm; Thursday and Friday from 9am – 4pm; and by appointment only on Saturday. Your complete eye health is our top priority! Do You Close Your Eyes When Eating Something Unbelievably Delicious?